Ancient Abbey wrote: I've not tried it, sorry. Brewed your recipe last night with this yeast, only changed the hops, Brewer’s Gold for bittering, and Mittelfrüh at 10 minutes. I did a simular recipe over the weekend with redx instead of munich and my current lager strain. Interesting, couldn’t get a hold of it. I might make another one with Spalter one day to see the difference. Spalter Select is easy to source over here, but true Spalter is more difficult to find. Ancient Abbey wrote: Altbier was my gateway to German beer and brewing. I'm a big fan, though it has taken a back seat to helles styles as of late. At its core, you can almost think of altbier as a dunkel brewed with ale yeast, hopped to taste and well lagered. Some are hopped like pilsner beer and some are more moderate like a festbier. 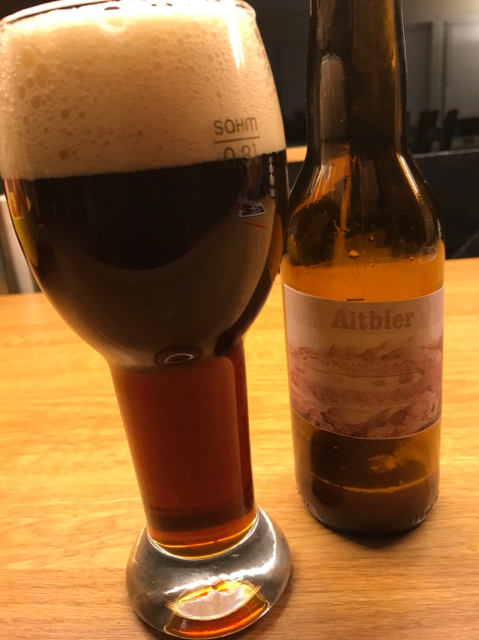 The simplest altbier is a 12P SMaSH beer with Munich (Dunkel) malt, a bit of sinamar (or 1% carafa special) and hopped to 24-30 IBU. Schumacher would be a good example of this style. I tend to like the lower range, 24-27 is the sweet spot for me. Examples that are destined for export and extensive travel are generally pilsner based and use caramunich in place of the brühmalz, upwards of 10-15% of the total grist. Zum Uerige would be a good example of this. I like them both, but I find there is definitely a difference in crispness between the Munich and Pilsner malt based versions. Brew the one that suits your tastes. Here is a recipe that got me a BOS a year or so back and was entered this past year in the GABF Pro-AM. I know lupulus got to try the commercial version at BAGF, so maybe he can offer his observations. I tend to fudge the gravity range and brew the sticke (13-14P) strength for competitions, as that seems to be what the judges reward. I also increase the hops for the extra gravity and anticipated loss during extended lagering. For a normal altbier to drink at home, I adjust this recipe down to 12P with ~27 IBU. I rarely change the % karamalz or rostmaltz much anymore, but I will vary the amounts of Pilsner, Vienna, Munich and Melanoidin malts to my mood that day or what beer I have in the pipeline (Hint: Vienna as the base is tasty and one of my favorites, but doesn't seem to me to match any of the commercial examples). I'm planning to brew an Altbier in the coming weeks. You speak of lagering @0C for an "extended" period. How long should that typically be? Treat it as you would any lager, like a dunkel. I generally wait a month, but they can last 3-6 months depending on the flow of the beer pipeline. I ferment in a plastic bucket, so will it be better to let it mature in the bottle? Maybe better against oxygen ingress? bjanat wrote: I ferment in a plastic bucket, so will it be better to let it mature in the bottle? Maybe better against oxygen ingress? If kegging isn't an option, then yeah that's what I would do. And here it is, brewed Jan. 16th, your recipe. It really needed the lagering, not muddy anymore. Munich dominates, no roast, a little caramel. Slight hop aroma. Primed with speise, which should be beneficial, but I want to buy a CPF and fill with low carbonation and finish with speise. Fermented with K-97, which gave a surprising amount of esters despite the low temp, about 13C. Last edited by bjanat on Fri Mar 02, 2018 3:02 pm, edited 1 time in total.